Want to surprise someone with a special breakfast? Search no longer, treat them with our Apple Roses, a thoughtful croissant to express your love or appreciation. Remove the core from the apples and cut them down the middle. Use the apple halves to slice very thin slices. Fill a saucepan halfway with water and squeeze half a lemon in it as well. Place the apple slices in the saucepan. Heat the pan for 3 minutes on medium heat. Then, remove the water by using a sieve. Open the croissant dough and roll the dough out. Rub the diagonal cutting edges closed, until the holes have faded/disappeared and cut the slab into three parts down the vertical cutting line. Cut each of the three parts into three or four long strips. Cover the strips with a dab of apricot jam using a brush. Place several apple slices onto the dough so that they overlap a little and the top of the slices stick out on the top. Sprinkle them with a bit of sugar and cinnamon. Carefully roll them up and make sure the end of the strip is stuck onto the dough. Place the roses in cupcake molds (so that the shape stays round), but cover the edges with butter first. Bake the roses around 20 – 25 minutes at 200°C in the middle of the oven until the dough is done. 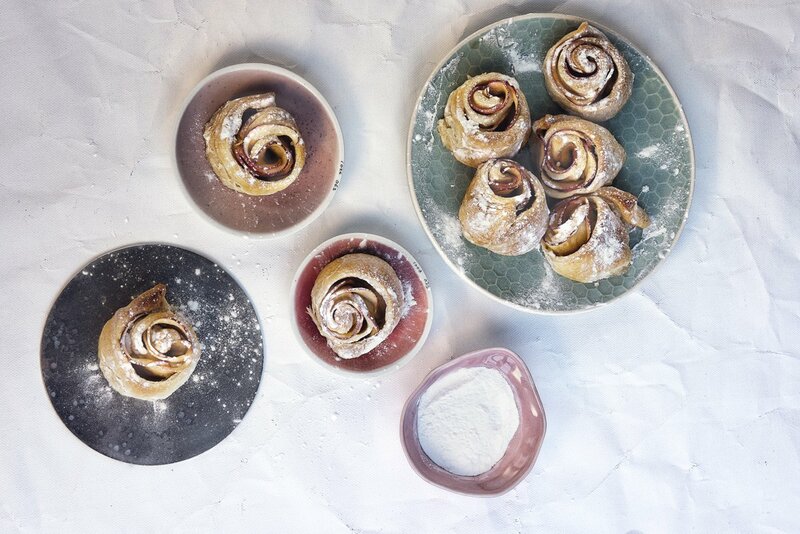 Once the roses have cooled down, sprinkle them with powdered sugar.